INSIDERS. What better way to start the week than to head down to Staples Center or flip on FOX Sports West? 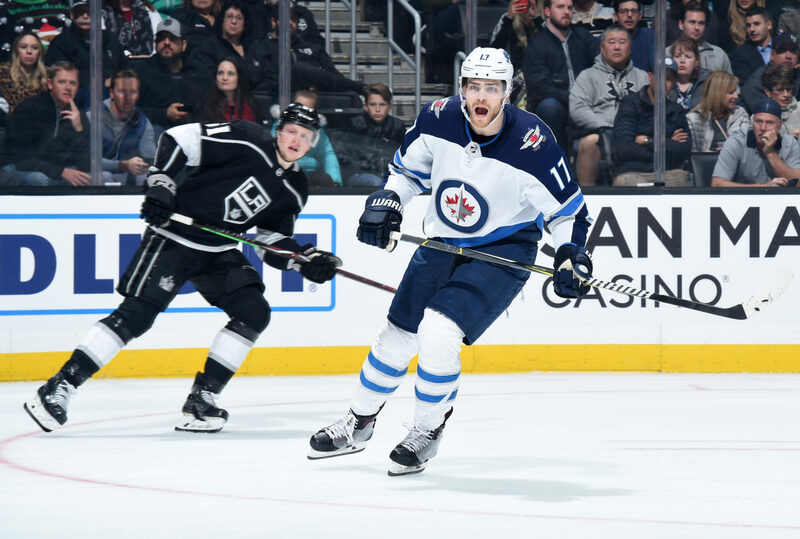 The LA Kings host the Winnipeg Jets for the rubber match of their 2018-19 season series (7:30 p.m. / FOX Sports West / FOX Sports app / LA Kings Audio Network), and though they didn’t hold a full-team morning skate, yesterday’s alignment indicates that we might see a similar lineup to Saturday’s, but with Ilya Kovalchuk in, Kurtis MacDermid out, and a return to the 12 forward-six defenseman balance. –The vitals: Jack Campbell was the first goalie to leave the ice and is the projected starter versus Winnipeg, against whom he is 0-1-1 with a 2.00 goals-against average and a .948 save percentage over two career games, both starts at MTS Centre. It wasn’t quite possible to get a firm sense of who exactly will fill out the lineup, but the projections are that Jonny Brodzinski, Kurtis MacDermid and Sean Walker will be out. Drew Doughty is expected to play his 400th consecutive game. Wait for the song(s). –Their vitals: Laurent Brossoit, who sounds as if he should be from Sept-Iles but is actually from Port Alberni, is the confirmed starter. His lone career appearance against Los Angeles was the Kings’ 4-1 win on December 18, one of five regulation losses in 19 decisions this season for the former 2011 Calgary sixth round draft pick. Brossoit has been among the most successful back-ups in the NHL this season with a .929 save percentage that’s tied for third in the league among qualified goalies. Winnipeg will be without Joe Morrow (lower-body), Josh Morrissey (upper-body) and Dustin Byfuglien (ankle) and will start grindin’, role playin’ Matt Hendricks in place of Jack Roslovic. Via Jamie Thomas of Jets TV, Winnipeg should line up with forward groups of Laine-Scheifele-Wheeler, Connor-Hayes-Ehlers, Tanev-Lowry-Little and Perreault-Copp-Hendricks with defensive pairings of Beaulieu-Trouba, Kulikov-Myers and Chiarot-Niku. Sami Niku, selected 198th overall in 2015, is the only player drafted after Matt Roy (194th overall) from the 2015 draft class to make his NHL debut. The Jets are 23-6-4 in their last 33 games against the Pacific Division and continue their road trip with games at Anaheim and Vegas Wednesday and Thursday. I don't want to add any pressure to the situation, but if the Oilers lose this game they are mathematically eliminated from the playoffs. There’s a lot of pride in being a native Winnipegger, though Leipsic’s career has brought him to a number of interesting places. A four-year standout with WHL-Portland, he joined the AHL’s Milwaukee Admirals to begin his professional career as a Nashville draft pick. But the Predators traded Leipsic along with Olli Jokinen to Toronto in an exchange in advance of the 2015 trade deadline, and after 141 games with the Marlies and an additional six with the Maple Leafs, the former third round draft pick was left exposed in expansion and claimed by Vegas. After 44 games with the Golden Knights he was traded again, this time to Vancouver, where he remained through the end of the 2017-18 season and the first quarter of 2018-19 before he was claimed off waivers by Los Angeles. So, Leipsic, who turns 25 in May, has been betrothed to five NHL teams, appearing in a total 124 games for four of them. He wouldn’t mind settling down for a bit. “I’ve been in a lot of places, but I love it here in L.A.,” he said. Whether or not that comes to fruition will be among the more noteworthy restricted free agent decisions the team will be forced to make this off-season. Leipsic is one of 12 RFAs the team must qualify by June 25 in order to hold on to their rights and negotiate a new contract. For many impending RFAs, like Alex Iafallo, Adrian Kempe, Matt Roy, Cal Petersen, Daniel Brickley, Michael Amadio and Sheldon Rempal, this is essentially a formality. The Kings will submit a qualifying offer, which is either accepted or rejected by the player. If the player accepts, they’re locked into that salary for the upcoming year. If they reject it, the team retains the player’s rights and has until their arbitration date to come to terms on a new contract. If no qualifying offer is submitted, the player becomes an unrestricted free agent. For a player with a $650,000 salary this season, Leipsic’s qualifying offer would be calculated as 110% of his base salary, which would hypothetically clock in at $715,000 for 2019-20. In other words, he’s among those with something very tangible to play for over the season’s final 11 games. Other teams put in claims on Leipsic when he went on waivers, depicting that there was interest around the league in adding a young, versatile player for no assets apart from minimal cap space. With five goals and 17 points in 43 games since his move down the West Coast and a willingness to work, he’s produced at an acceptable level for a player who has skill and skates well but fits best as a bottom-six piece. He’s also capable of playing a role on a second power play unit as someone with good tenacity at pulling pucks off the boards and getting them back into the hands of his teammates. –Happy trails to the Kootenay Ice (1998-2019), winners of the 2000, 2002 and 2011 WHL Championships and the 2002 Memorial Cup. After 20 seasons in the Rocky Mountains, the Cranbrook, B.C.-based team will relocate to Winnipeg for 2019-20. That the team would reach out to Stoll with its days numbered to pinpoint him as a player who represents the legacy of a highly successful organization is a tremendous honor. Owned by the Chynoweth family – the late Ed Chynoweth was an influential pillar of major junior hockey from coast to coast who was posthumously inducted to the Hockey Hall of Fame as a builder in 2008 – the Ice, after relocating from Edmonton in 1998, had been a culture-driven model of stable ownership in a small market surrounded by league heavyweights whose budgets grew significantly in the past decade and a half. It’s a bit, well, hillier, but Cranbrook’s small-town ethos and the hockey rink as a center of the community reminded Stoll of his Saskatchewan roots. The final game in Kootenay Ice history was a 5-4 win over the visiting Red Deer Rebels in front of 2,684 fans on Sunday afternoon as Mikey Milne scored the game-winner with 5:44 to play. They’ll be referenced early at the 2019 NHL Draft when center Peyton Krebs, the eighth-ranked North America-based skater, is announced throughout Rogers Arena. –You’re probably familiar by now that whenever the Kings and Jets meet, Assistant Coach Dave Lowry is able to spend some quality time with his son, Adam, amidst the nonstop regimen and the immediacy of point-to-point NHL travel. This year’s schedule provided a better break than usual during the season’s dog days. This allowed for an important family barbecue and get-together in the South Bay Sunday evening. Regrettably but understandably, former Kings prospect Joel Lowry, who has 26 points in 44 games with AHL-Springfield this season, wasn’t able to commute across the country for the family get-together. These moments in-season are rare. As an NHL coach, schedules don’t align regularly, and amidst the travel and preparation it’s a challenge for Dave to find time to even watch his kids play, let alone be in the same room as three of them. Adam, who like his family members can play a hard, committed game, is a menace in front of opponents’ nets and plucking pucks off the boards. Entering his 349th NHL game tonight, the 6-foot-5, 210-pound forward has established a strong identity as a physical and versatile forward with responsible instincts who plays the way his size suggests. The elder Lowry – that’s Dave – made it to second round playoff games in Nashville and Winnipeg last spring and games in Vegas during the Western Conference Final. But tonight, during the run of play, there won’t be a great deal of attention to Adam beyond what’s necessary to best prepare the LA Kings to win a late-season game. It’s harder than it sounds. Inter-family match-ups are the downside that come with a legacy of family success in the NHL, and Lowry has shared in the past that he’s not overly fond of coaching against his kin. “I’ll be happy when the game’s over,” he said with a smile. –More to come, Insiders. Tonight’s officials are referees Marc Joannette and Frederick L’Ecuyer and linesmen Shandor Alphonso and Devin Berg. Hannah Davey and Temecula Road will handle tonight’s national anthems. It’s Country Music Night at Staples Center, with attendees receiving a Drew Doughty Cowboy Bobblehead. Should “Cowboy Bobblehead” be capitalized? Is this what my college education went towards? I’ll leave you with that to discuss among yourselves. Let’s talk soon, Insiders. To the city of Cranbrook thank you for the amazing 21 years you supported the @WHLKootenayICE franchise…so many great memories you helped us create…sad day for sure but remember these good times….